The Philippines' Pasig River, the cradle of early Manila civilization, has been selected as a finalist in the first ever Asia Riverprize by the prestigious International RiverFoundation (IRF) and is competing against China's Yangtze River, which recognizes and rewards organizations who are making a difference through effective river basin restoration and management programs. It is a back-to-back nomination for the Pasig River Rehabilitation Commission (PRRC) who just came from a successful campaign in the 2017 Thiess International Riverprize competition where the Pasig River was hailed as runner-up to the winner, San Antonio River of Texas, USA. 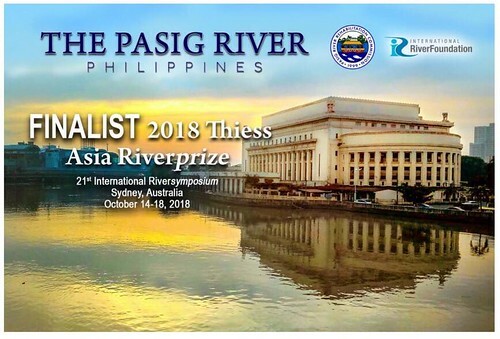 PRRC Executive Director Jose Antonio E. Goitia says that “the consecutive entries of the Pasig River as a finalist in the 2017 and 2018 Thiess International and Asia Riverprize, respectively, is a testament that the world recognizes the efforts of the Philippine government to restore the Pasig River and its environs since PRRC was established in 1999.” Initially, the competition was called the Asia-Pacific Riverprize Awards which was opened to entrants from New Zealand, Australia, and 45 other countries. However, according to the IRF, due the to the high number and quality of entries received, they have made the decision to split the promoted Asia-Pacific Riverprize into two: Asia Riverprize and another category for the Australasia Riverprize. After a series of tedious deliberations, the IRF has announced and congratulates the organizations chosen as Asia Riverprize finalists with the highest honors in river restoration and protection namely: the Pasig River (Philippines) and the Yangtze River (China). Goitia adds “last year, the Philippines is the only third world and developing country that made it into the international finals and bravely competed with the US and the United Kingdom. In this year’s Asia Riverprize, we will be facing another super power – the red dragon, China. However, with an indomitable spirit, we remain steadfast and optimistic that we will stand triumphant in the end.” In behalf of the IRF’s board of river basin experts, IRF Director Professor Bill Dennison says that “these different river stories are united by a common theme: excellence in river management.” The Riverprize is not a competition of which river is more beautiful or cleaner. This is the reason why the IRF, comprised of river management experts and professionals from around the world, has given importance and consideration to the rehabilitation efforts of the PRRC to bring back the Pasig River system to life. It has acknowledged PRRC’s commitment in delivering quality projects, programs, and activities in easement recovery, housing and resettlement, riverbanks development, waste and water quality management, and public awareness. Compared to the 1990s when it was declared "biologically dead," the Pasig River's condition now has significantly improved. Although the Pasig River development is a work in progress, many areas along the historic river have already shown signs of aquatic life and it has already become conducive for transport, recreation, and tourism. PRRC’s Executive Director Jose Antonio E. Goitia, together with Public Information, Advocacy and Tourism Division Head George Oliver G. De La Rama, will be presenting and defending the Philippines’ Pasig River entry to a panel of esteemed judges in the upcoming 21st International Riversymposium on October 14 to 18, 2018 in Sydney, Australia. Members of PRRC’s Management Committee will also form part of the Philippine delegation. The winner of the 2018 Asia Riverprize will receive widespread global recognition which can build new partnerships, provide opportunities for exchange of knowledge and best practices, and open doors for international support. Furthermore, the winner will automatically qualify for Stage Two of the Thiess International Riverprize in 2019. As one nation, the PRRC seeks everyone’s support to its Pasig River entry in the 2018 Asia Riverprize. The Pasig River's victory is the victory of the Philippines and every Filipino who works hard and shares the same vision of saving our waterways and the environment. It will be the triumph of all who believe that the dream of a clean and alive Pasig River is within reach!